This topic describes how to you can specify tags to be automatically applied to resources at creation time. If you're in the Administrators group, then you have the required access for managing tag defaults and tag namespaces. For specific policy information for this feature, see Required Permissions for Working with Tag Defaults. If you're new to policies, see Getting Started with Policies and Common Policies. If you want to dig deeper into writing policies for tagging or other IAM components, see Details for IAM. Alice is a finance administrator and has access to the restricted tag namespace Finance. Alice can set up a tag default to apply the Finance.CostCenter tag to all resources with a value of W1234. Eli can create resources but does not have access to the Finance tag namespace. When Eli creates a resource, the Finance.CostCenter tag is automatically applied with a value of W1234. Eli cannot change this tag, and Alice is confident that it will always be applied correctly and not changed by the users who create or edit resources. Tag defaults allow tenancy administrators to create secure permissions boundaries between users concerned with governance and users who need to create and administer resources. Tag defaults are defined for a specific compartment, and in the Console you manage them on the Compartment Details page. For the full mapping of permissions to API operations, see Details for IAM. Now when TagAdmins create tag defaults in CompartmentC, they can use tag namespaces that reside in either CompartmentA or CompartmentZ. Tag defaults can only be set up for defined tags. Free-form tags are not supported for tag defaults. You can define up to 5 tag defaults per compartment. 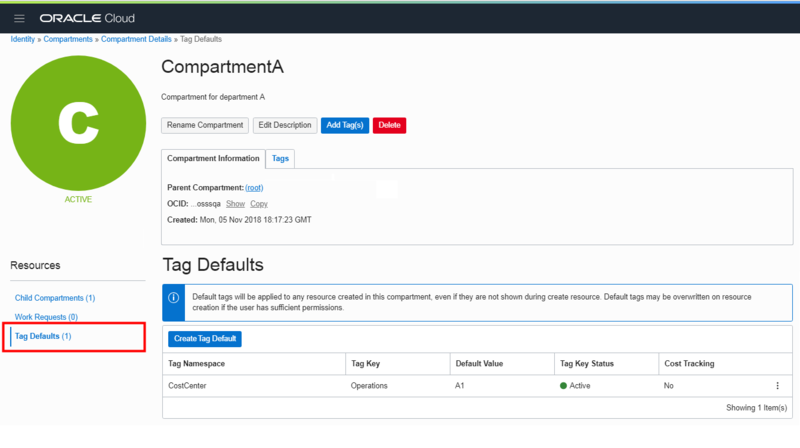 After a tag default is created, the default tag is applied to any new resources created in the compartment. Previously existing resources in the compartment are not tagged retro-actively. Similarly, if you change the default value of the tag default, existing occurrences are not updated. And, if you delete the tag default from the compartment, existing occurrences of the tag are not removed from resources. The default tag is applied to all resources that get created in the compartment, including child compartments and the resources created in the child compartments. In CompartmentA, you create a tag default, TagA. Resources (and compartments) created in CompartmentA are automatically tagged with TagA. In the subcompartment, CompartmentB, you create tag default, TagB. Resources and compartments created in CompartmentB are automatically tagged with TagA and TagB. In the sub-subcompartment, CompartmentC, you create tag default TagC. Resources created in CompartmentC are automatically tagged with TagA, TagB, and TagC. 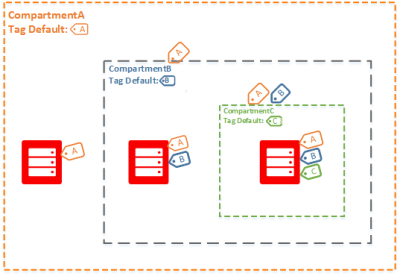 Tag defaults can be overridden at the time of resource creation by users who have the appropriate permissions to both create the resource and use the tag namespace. Example: CompartmentA has a tag default defined to apply CostCenter.Operations="42". Pradeep belongs to a group that grants him permissions to create instances in CompartmentA and also to use tag namespaces in CompartmentA. He creates an instance in CompartmentA, and in the Create Instance dialog, he applies the tag CostCenter.Operations="50". Because he has the appropriate permissions, when the instance is created, the tag default is overridden, and the instance is tagged with CostCenter.Operations="50". After a resource is created and tagged, users with the appropriate permissions to both update the resource and use the tag namespace can modify the default tags that were applied at resource creation. Retired tags can't be applied to new resources. Therefore, if the tag namespace or tag key specified in a tag default is retired, resources can no longer be created in the compartment, because the retired tag cannot be applied. You must delete the tag default that specifies the retired tag to continue to create resources in the compartment. There is a limit of 5 tag defaults that can be defined per compartment. See Limits on Tags for more limits on tags. 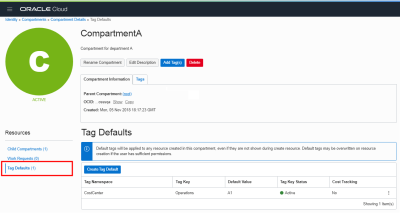 Avoid entering confidential information when assigning descriptions, tags, or friendly names to your cloud resources through the Oracle Cloud Infrastructure Console, API, or CLI. Open the navigation menu. Under Governance and Administration, go to Identity and click Compartments. A list of the compartments you have access to is displayed. In the list, find the name of the compartment you want to add a tag default to and click its name. On the compartment details page, click Tag Defaults. The list of existing tag defaults is displayed. Tag Namespace: Select the tag namespace for the tag default. Tag Key: Select the tag key. Default Value: Enter the value you want this tag to have. In the list, click the name of the compartment that has the tag default you want to update. Find the tag default you want to update. Go to the the Actions icon (three dots) and click Edit. Enter the new value for the Default Value. In the list, click the name of the compartment that has the tag default you want to delete. Find the tag default you want to delete. Go to the the Actions icon (three dots) and click Delete.